Thomas Jefferson, “Thomas Jefferson,” Histories of the National Mall, accessed April 23, 2019, http://mallhistory.org/items/show/301. Thomas Jefferson worked with President George Washington to advocate that the nation's capitol be situated on the banks of the Potomac. His sketch of a layout for the federal city is the oldest known plan of Washington, DC, and he shared his ideas with many of the early planners and architects of the city, including L'Enfant, Hoban, and Latrobe. He was the first president to serve entirely in Washington, DC, and he used the Ellipse and White House grounds for some of his scientific and agricultural experiments during his time in office. Image from the Independence National Historical Park Collection, via National Portrait Gallery. 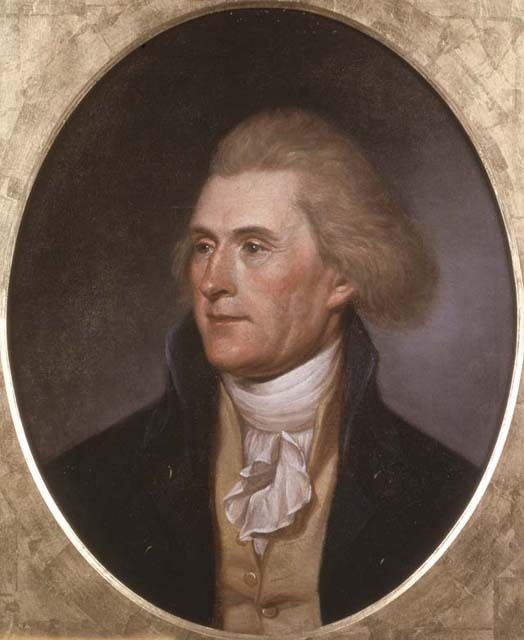 Thomas Jefferson drafted the Declaration of Independence. He was the first Secretary of State (1790-1793) and third President of the United States (1801-1809). Learn more about Jefferson from the website of his plantation, Monticello.